This time of the year, you might likely have visitors dropping by for many reasons. There are harvest and Halloween parties, homecoming events, or just to have a cup of coffee and visit out of the rain. Here are 5 quick, easy and frugal ideas you can use for Fall entertaining. 1) Popcorn Cones (shown above). My local Dollar Tree has rolls of brown paper for just $1. I picked up a couple because I like to use them for Christmas wrapping paper. Once I got home, I realized I needed some cheap entertaining ideas for some last minute get togethers, so I pulled out the brown paper. We used it to turn plain old popcorn into a fun snack for company. Just pop up some popcorn and add different toppings that you like (salt and pepper, parmesean cheese, cinnamon and sugar, etc.). If you want to be really festive you could use food coloring to make it orange this time of the year, but we opted to forgo the food coloring. Take out your roll of brown paper and cut into 12 by 12 squares. Roll them on the diagonal to form a cone shape. You can then either staple or tape them to secure the cone, and fill it with your popcorn mixtures. If you want to get really fancy you could add labels for what flavor each on is. Add the cones to a wide mouth vase or container you have on hand and put out for all to enjoy. You could fill with many other things, if you do not like popcorn. Serve with hot chocolate, hot apple cider, or sparkling cider and everyone feels like they had a special treat. Best part is that it did not cost you too much time or effort! 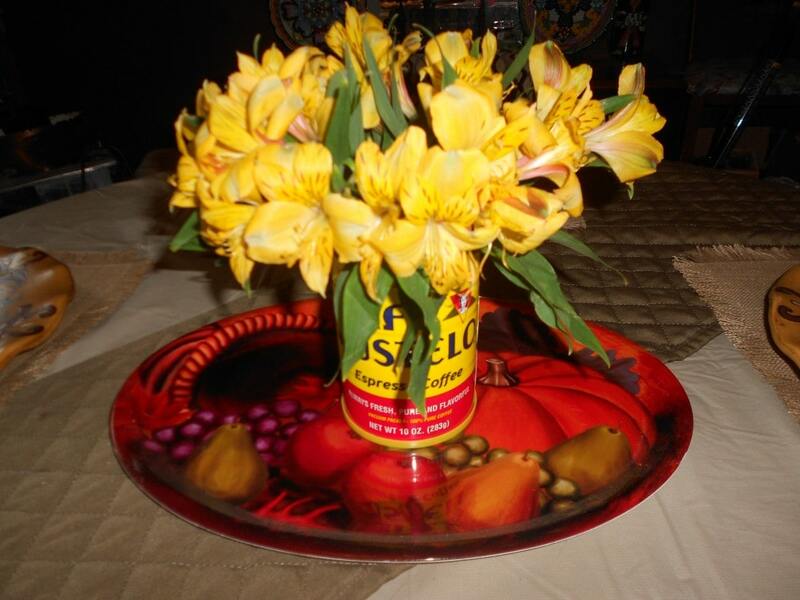 2) Reuse Coffee Cans (or other containers) as a Vase for Centerpiece. 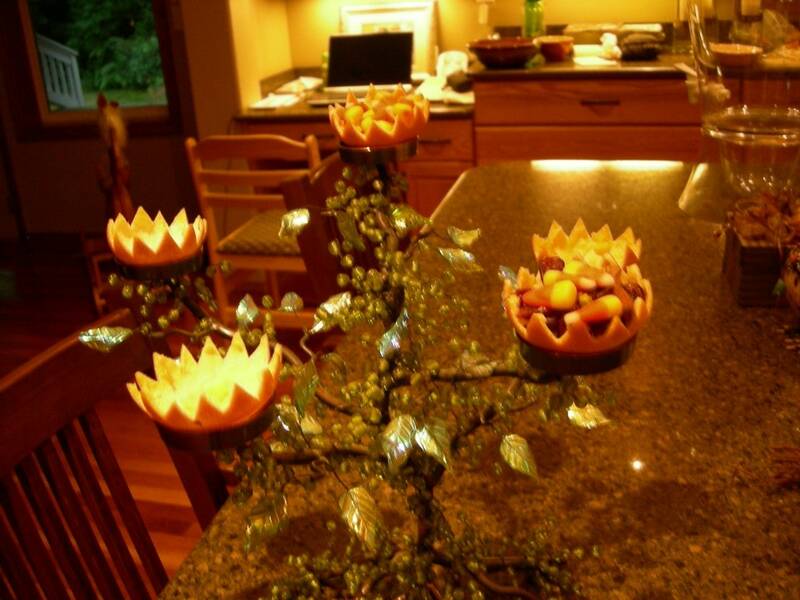 Need a centerpiece? I just grabbed an old coffee can (I shared my secret to finding cheap Bustelo Espresso here. Not only do I love it for the coffee, but I use the tin cans for so many things afterwards as well!). My local QFC has bouquets of flowers on sale from $.99 to $1.99 (Manager Specials). I bought a $1.99 bunch of flowers, cut them down and made a quick centerpiece to put out. I bought another $.99 cent bouquet, took it out of the plastic, and cut off the older leaves. We rearranged it in the same brown paper shown above, and had a very nice fall bouquet to use as a hostess gift that we needed this week. I found dried fall flowers for $1.99 at Fred Meyer too, and this would be another nice option. Have oranges on hand. Cut them in half and remove the orange from inside. Use scissors to cut the jagged design around the edge. Add a small votive candle or fill with a nut mixture. We had a votive holder that we used to do both with (we lit candles and added a nut and candy corn mixture to). Bonus part is that they smell good too! They will eventually dry up, so its just a fun short term decoration. This one is great if you are really on a budget, but don’t want to dissapoint. Rather then buy the pricey Ciders you find in the produce department (as good as they are, they are budget busters), head over to the juice isle, and grab a 64 oz container of Safeway Cider for as low as $.38 this week. 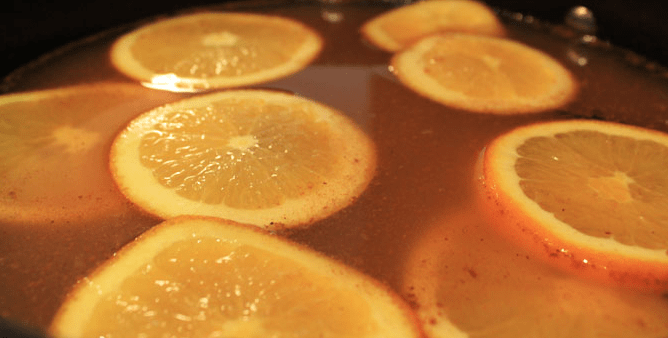 Pour it into a pot over low on the stove, add some cinnamon sticks (or sprinkled cinnamon), nutmeg and orange slices and let it slowly warm up (I get my cinnamon sticks in the aisle with Mexican food for around $1 at stores like Winco). For the homemade cinnamon donuts, you will need a container of refrigerator biscuits, cinnamon, sugar and oil to fry them in. Start by mixing cinnamon and sugar on a plate to dip your donuts in once they are fried (you can also put it in a paper bag and shake the donut in there for a good coating). Next heat your oil over medium heat until its ready to fry. Take the biscuits out of the packaging, and you can fry them up just as they are, or you can use your fingers to create a hole in the middle for a more traditional donut look (or a cookie cutter and then fry up the donut holes too!). Fry on each side until golden brown (about a minute per side). Make sure your oil is not too hot though, so that they cook through. Toss in the cinnamon and sugar straight off the oven. Serve warm for best result! What are some of your favorite frugal entertaining ideas this time of the year? 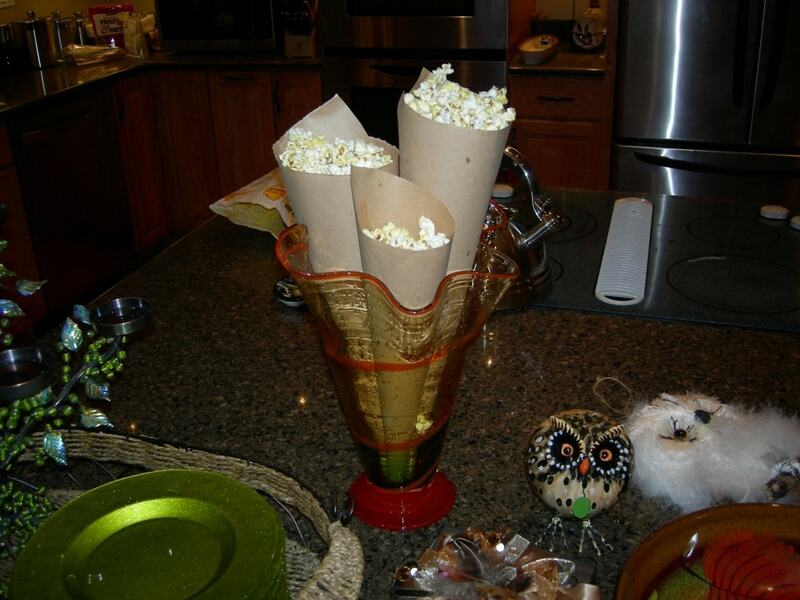 Love the pop corn cones…that would’ve been a much better way to serve popcorn at my movie night on Saturday – oh well, next time!